The Rockland Bulldogs made a statement this year and asserted themselves as a force to be reckoned with once again in their league. Rockland finished the regular season with an impressive 5-2 record beating teams like EB and Middleboro along the way, while getting a share of the South Shore League title. This put Rockland in position to really make something happen in the postseason, as they were placed as the third seed in their bracket. In their first postseason game of the year the Bulldogs bested the Cardinal Spellman Cardinals in a hard fought game with a lot of momentum changes. This was the team’s first playoff win in 17 years, and for the team it was a long 17 years. After their history making win against Spellman, Rockland set out to continue their playoff run. The next round would be a battle of the Bulldogs: Old Rochester Bulldogs vs. Rockland Bulldogs. Unfortunately, Rockland’s Cinderella run was ended prematurely. They were defeated 12-8 in heart-breaking fashion. Although the loss was a huge blow to the coaches and the players alike it did not take away the accomplishments that were made during the season. For a very long time Rockland was a team that was tough and always played with a chip on their shoulders, but never really made anything happen. This season was proof that Rockland was done with being mediocre, and was ready to take the next step as a great team. 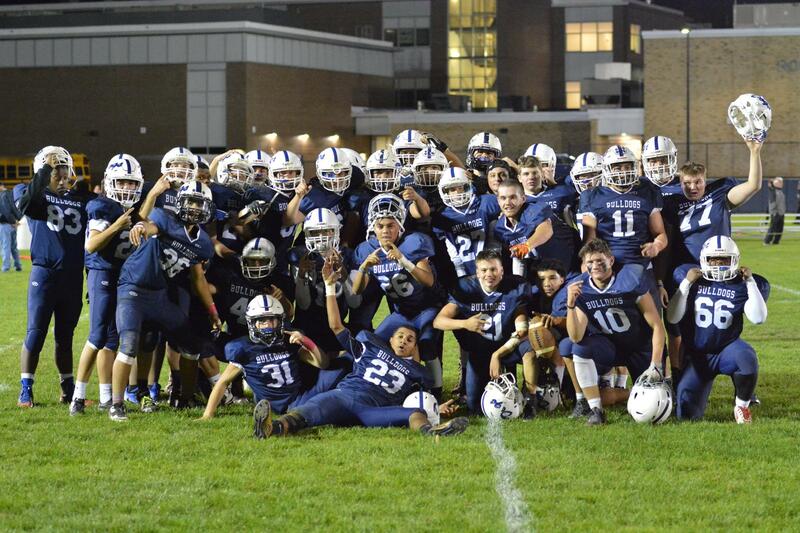 The team not only snapped a 17 year playoff drought, they also won the title of South Shore League champs in the process. One man that really helped the Bulldogs throughout the year was senior Gavyn White. White was named the team’s unsung hero by coaches Nicholas Liquori and Fred Damon for his outstanding work down in the trenches (see story page 7). This team, given a fresh start with their new head coach, Mr. Liquori, really made the most of it. This year will hopefully jump-start the program that was dormant for so long into a whole new era of Dogs’ football. “It was my senior year so it really means a lot to me that we were able to be part of the the team that turned the program around, and I’m sure that goes for all of the kids on the team,” said White. I’m sure he speaks for all the seniors that are playing their last game in a Rockland football jersey on Thanksgiving Day that this year was something really special, for both the boys in blue and the entire town of Rockland.